These are high quality and very beautiful. These are hollow and dent free. These are in excellent pre owned condition. I'm really easy to get along with and try my best to make this a pleasant experience for all involved! 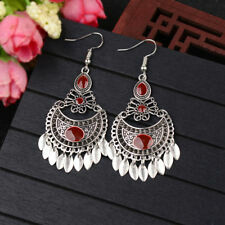 Pretty sterling silver garnet crystal drop earrings, marked 925. In very good condition. Just need cleaning. These are high quality and very beautiful. These are in excellent pre owned condition. 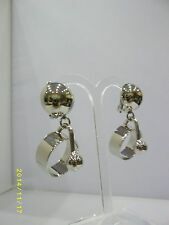 VINTAGE GIANI BERNINI 925 STERLING SILVER EARRINGS PIERCED ETCHED HOOPS 1 3/16"
IN NICE CONDITION, SEE THE PICTURES. Stone(s) Turquoise. That being said, mistakes can occur. # of Pieces 1 pair. The closures are working and usable. Material Silver. THE EARRINGS HANG 7/8" LONG WITH THE LABEL ON BACK THAT READS " GREEN AMBER AND. 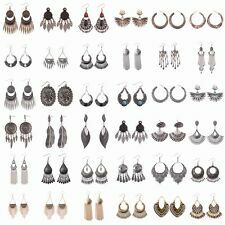 925 EARRINGS ". THERE ARE NO MARKINGS THAT I CAN SEE ON THE EARRINGS BUT THE BACK CONNECTOR IS MARKED 925. ALL PIECES ARE FROM ESTATES. These are high quality and very beautiful. 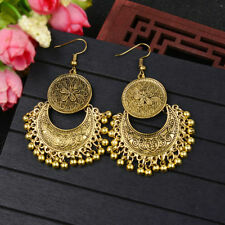 This pair is a large pierced hoop design. These are in excellent pre owned condition. We will not misrepresent the value of the item on any custom form, invoices or etc. and we won’t mark an international item as a gift. It's against the law. We are eager to resolve any issues you may have. Very nice pair. They have a stone in each one, which could be opals, but I am not sure. It still moves to the closed position well, but I will let the new owner bend it back to original position. They're in very good condition. Large Heart clip on earrings marked Foree. 925. Weighs 27 grams. Don't miss it. This will be a great addition to your collection. SPARKLING " CONTESSA DI CAPRI " WITH LOCKING BACKS DANGLES WITH WIRE 3/4", THE OTHER PEARL DANGLES 1 1/2" LOCKING BACKS. NEED WEE POLISH IN VERY NICE CONDITION, SEE THE PICS. This beautiful pair of sterling earrings features lapis and are marked 925. They measure about 1 1/2 inches long and 7/8 of an inch across at their widest point. They are in nice condition, but one is missing the clutch back. 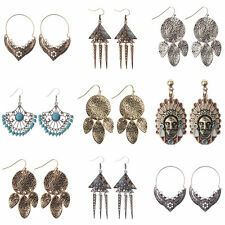 ~ DANGLE EARRINGS PERFECT FOR ANY OCCASION. Vintage HUSKY Dog Sterling Silver .925 Mexico Pierced Earrings Jewelry 3.9 gm. Shipped with USPS First Class Package. NOT MARKED BUT TESTED MAY NEED POLISHING. Nice addition to add to your collection! Vintage Modern Sterling Silver earrings, Mexico. Excellent condition, estate find. These are post earrings, Marked 925 Mexico. 2 1/4 inches long.�� 1970s? Free first class shipping. Backs not sterling. Preowned condition. Unless there is a heavier item involved. Vintage Sterling Silver Double Hoop Dangle Earrings . Shipped with USPS First Class Package. In good condition. Looks Older. Has the under hook clip fastener. See photos and if you have any questions feel free to ask. Enjoy. This is a pair of small vintage sterling silver screwback earrings. Each earring is marked sterling and the pair weighs 5.1 grams. The nickel is shown to give reference to size and is not included in the auction. Little Nantucket baskets hanging fron a hook for pierced ears. Bought as a souvenir about 30 years ago. Sterling silver. 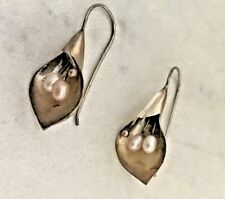 Vintage Sterling Silver EARRINGS ART NOUVEAU Ball Dots PIERCED DROPS Hanging. Size: approx. 1" long Hallmarked unknown maker Also marked 925 Very good pre-owned condition. Shipped with USPS First Class Package. REAL BEAUTIES! ALL MAJOR ISSUES WILL BE NOTED. Preowned condition. Unless there is a heavier item involved. For restoration. They are shown by a ruler for size comparison. Weight(grams) 21.1 grams. Material Sterling Silver. That being said, mistakes can occur.